Available at New Spring Press and through Amazon. Dr. John Beard’s study of the mammalian placenta led him to the conclusion that in its early incarnation, this tissue behaves much as a cancerous tumor. He then proposed that pancreatic enzymes regulate placental development, and in turn represent the body’s main defense against cancer. 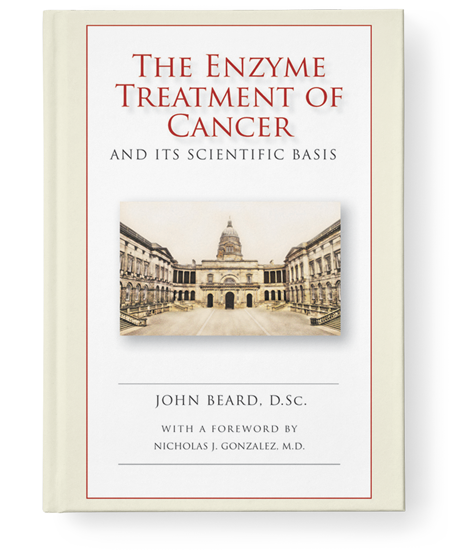 In 1911, he published The Enzyme Treatment of Cancer to favorable reviews. Though in his lifetime the scientific community never embraced his ideas about cancer – he died in relative obscurity in 1924 – in recent years, evidence from molecular biology and stem cell research increasingly confirms many of Dr. Beard’s fundamental precepts. This historic work is now available again, in a carefully recreated reproduction with a foreword by Dr. Gonzalez.